SFCAC encourages creativity and connection throughout the Bay Area community through a variety of partnerships. 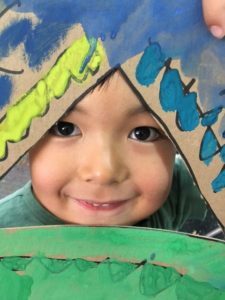 Since 2009 as part of the Preschool for All initiative begun by First 5 of San Francisco, the Art Center began providing a series of 11-week visual arts residencies in preschools throughout the city, serving hundreds of children in San Francisco. In addition to offering the opportunity for visual arts exploration to children, our teaching artists are providing in-service training to preschool teachers, sharing best practices, strategies, and skills in leading art-related activities. These residencies have been made possible through a collaboration with Performing Arts Workshop, an arts education organization that helps young people develop critical thinking, creative expression, and basic learning skills through the arts and by a grant from the Office of Early Care and Education. a program that provides free preschool for all four-year-old San Franciscans who’d like to attend, regardless of income. Raphael House, Clara House, and Holy Family Day Home – After school art classes at shelter for homeless families and children in transition in San Francisco’s Tenderloin neighborhood. Classes were offered for children ages 3 to 11. These programs gave children the opportunity to express themselves through individual and group art-making and provides a supportive environment for exploration to develop perceptual skills, creative problem-solving and critical thinking. The San Francisco Children’s Art Center is a member of the National Guild for Community Arts Education.